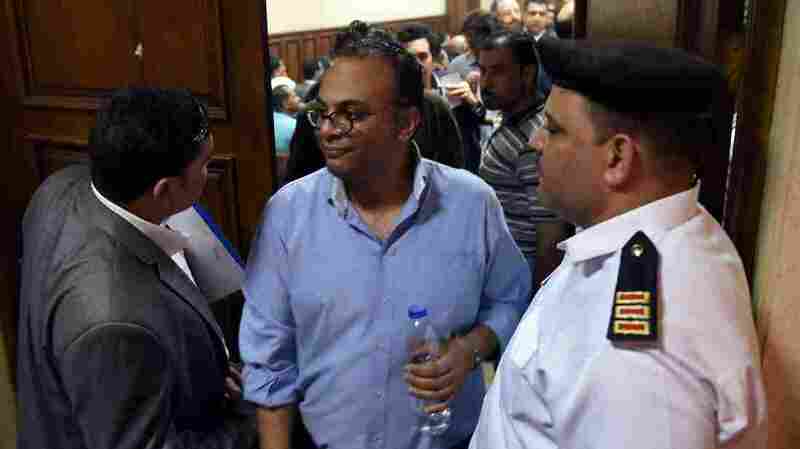 Egyptian human rights activist Hossam Bahgat (center) leaves a Cairo courtroom on Wednesday after a hearing in which the state requested a travel ban and freeze of his assests. The government has taken action against a number of groups and activists in what crictis say is an attempt to suppress opposition. Several prominent Egyptian human rights activists were in a Cairo court on Wednesday, accused of taking foreign funding to try to destabilize the country. They waited to hear if their bank accounts and their assets would be frozen as the state investigates alleged crimes against national security by their human rights organizations. The court expanded the case to include even more people and then postponed the decision until May 23. What could follow are criminal charges that carry up to 25 years in prison for some of the leading civil society campaigners in the country. They're being investigated for accepting foreign funds illegally. International observers say this reflects an ongoing crackdown by President Abdel-Fattah el-Sissi's government on a host of freedoms. And what's happening in Egypt — more than five years after Egyptians ousted Hosni Mubarak and demanded greater rights — isn't happening in a vacuum. Countries throughout the region are rolling back hard-fought human rights gains made over the past few years, all in the name of stability and the war on terror. Tunisia has declared a state of emergency allowing security forces to act without accountability after a series of militant attacks. Morocco is putting journalists on trial for a smartphone app they disseminated for citizen journalism. Many activists in Egypt say the country is going through the most repressive time in its modern history. But as repression has grown, so has dissent. "It's death to the only remaining space for organized dissent in Egypt," said Heba Morayef, the associate director of the Egyptian Initiative for Personal Rights. "It's not just about expression, it's also about space. And it's about human rights work." U.S. Secretary of State John Kerry meets Wednesday with Egyptian President Abdel-Fattah el-Sissi at the presidential palace in Cairo. Sissi has cracked down on activists and opposition groups, but the country still receives assistance from the U.S. and other Western countries. Her organization is one of the at least five human rights groups being investigated by the state. "They are blaming us for the fact that over the last six months people have started talking about torture again," Morayef said. "And people have started protesting when police kill people or shoot people." Like Tuesday, when a tea seller was shot after an argument with a policeman. Human rights groups say they are the latest victims of the targeting of public space. "We started bracing ourselves for it since the 2013 ouster of the former president and the arrival of this regime," said rights activist Hossam Bahgat, one of those who was in court on Wednesday. He says the government first dealt with the media, jailing and silencing journalists or co-opting them. Then they turned to the political opposition, passing a law that essentially criminalizes protests, conducted mass arrests and mass trials. "Our part has now come as the third victim and we know that the regime currently is convinced that we are part of a global and domestic conspiracy to bring down the state," Bahgat said. Sissi has referenced an "evil" plot against Egypt several times over the past few months. Egypt's Foreign Ministry on Wednesday accused United Nations chief Ban Ki-Moon of trying to intimidate the Egyptian judiciary. The ministry made the remark after a U.N. spokesman called for a fair trial in the case of Bahgat and his colleagues. Sissi's government has come under intense criticism for human rights abuses, especially following the torture and killing of an Italian doctoral student, Giulio Regini, in Cairo. Rights groups, Italian officials and Regini's mother say they suspect Egypt's security forces are behind the killing. "Let me say we are being confronted by an evil force that is trying to shake Egypt, and give a false impression of what is happening in Egypt," Sissi said. It's a refrain he's repeated when asked about human rights abuses. Despite the criticism of Egypt's human rights, the country continues to get financial and military support from Western governments, something that dismays rights groups. During Hollande's visit, business deals worth around $2.3 billion were signed. 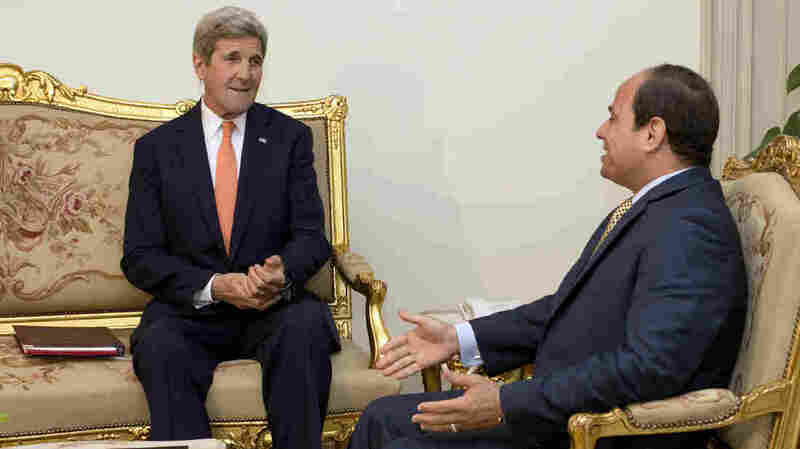 The U.S. provides the highest level of assistance to Egypt, and U.S. Secretary of State John Kerry was visiting the country on Wednesday. "The sad reality is that most foreign governments have learned absolutely nothing from the Mubarak days and from the time when they were caught by surprise by the Egyptian uprising or the Arab uprising," Bahgat said. "They are back now to exactly business as usual. They see Egypt as a rare, stable country in a region that is fraught with instability. And they are over-committed to this regime, just as they were over-committed to the previous regime," he added.